I’ve checked out several wallet projects on Kickstarter, but none of them had as many intriguing features as the Aki Wallet. 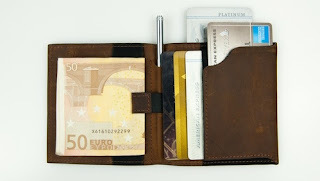 The goal with all of these designs is to make a sharp-looking wallet that remains thin, even when stuffed with your credit cards, IDs and other personal detritus. The Aki is made of stitched leather in brown, black or blue and looks like it passes the skinny test. What’s remarkable is how the Aki deals wit the stuff you put in it. For example, there’s a hidden slot for a SIM card. First time I’ve seen that. And there’s a slot that hold a couple of coins and another slot for a skinny pen. There’s something called a Ninja slot that lets’s you slide out your primary card without making the other cards visible. And the main card section has a pull-tab, so you’re not wrestling and tugging to free them. I’m not surprised that the Aki creators have already blown way past their funding goal. They still offer a wallet at the early bird price of $50 US when the Aki ships in January 2016. You can see the other rewards and get the full Aki story on the Kickstarter page.